Mark Hancock is a professionally qualified craftsman and advisor with a wealth of experience both stone carving and in the care and repair of historic buildings. He has worked with stone since 1980 and is the founder and director of Centreline Architectural Sculpture which was established in Gloucestershire in 1999. 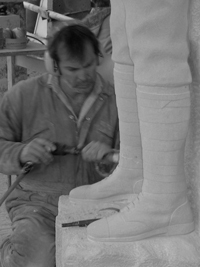 Since that date Centreline has attracted prestigious carving commissions from English Heritage; War Memorials Trusts; the National Trust; Local Authorities as well as individuals in Britain and France. Centreline regularly advises Local Councils, historic building architects and surveyors and Mark’s knowledge of stones and traditional techniques is a valuable asset of the company. Mark has been studying part time at UWE for the last three years and is now in his final year of his MSc in Building Surveying. 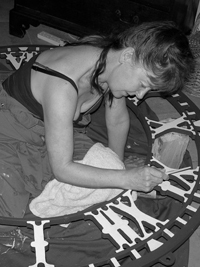 Gillian Hancock trained as a Town Planner, worked as a vernacular buildings surveyor for the National Trust and later Woodchester Mansion Trust and after gaining a post graduate diploma in Architectural Conservation joined Mark establishing Centreline. Undertaking various roles in the business she is equally happy writing reports, keeping the books, historical research, sourcing materials, dealing with the PR and HR as well as designing sculptures, fireplaces, decorative painting and, most recently, gilding.